ALLEGRA BOVERMAN/Staff photo. Gloucester Daily Times. 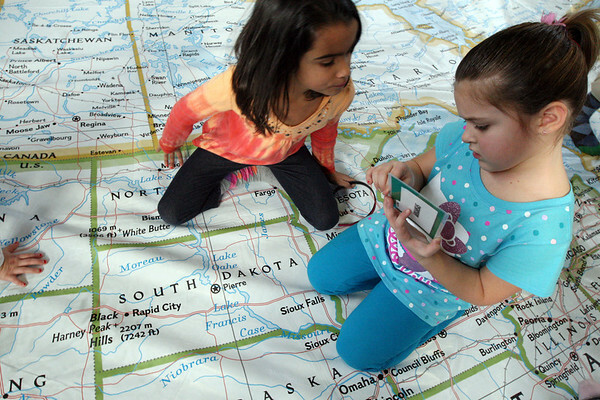 Gloucester: The North American National Geographic Giant Traveling Map is on display and in use at West Parish Elementary School until Jan. 12. The Physical Education teacher, Amy Elliot, who used to teach geography and social studies, has been incorporating the map into her exercise curriculum. On Thursday afternoon, the first grade class there was not only scrambling around and exploring the map, but teaming up with a partner to find states and cities on the giant map - that fills the gym - as though they were postal carriers "delivering" messages to those locations. The map travels next to East Gloucester Elementary School. Searching for Arkansas are first graders Chandra Lavery, left, and Mia Contilli.